Wow, what a couple of super-intense days! We’re here, in Alaska. 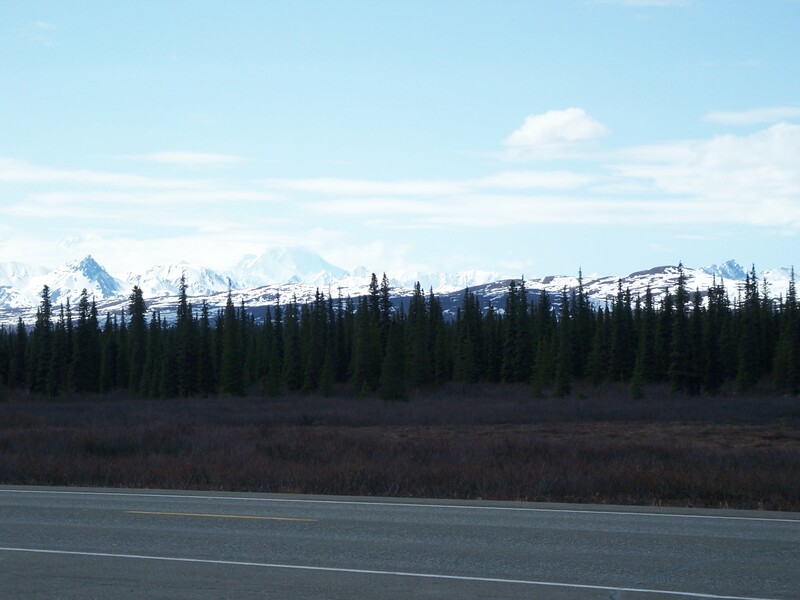 Seen Denali, seen a moose pee-in-my-pants close. Would have stayed at Santaland, North Pole, but Santa ain’t got no WiFi, so Santa don’t get no WI guy. 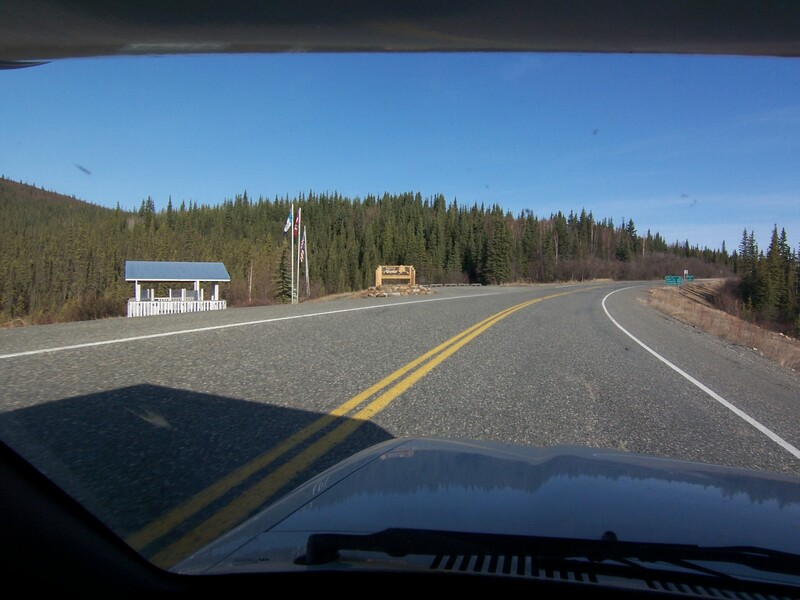 Ended up staying at Rosehip Campground, Chena River State Recreation Area. That’s where we ran into the moose. But I’m getting ahead of the story here. A few days ago, we ran into another (yes, yet another–Wisconsinites are everywhere!) nice couple from Wisconsin, actually from Green Bay (yes, I kowtowed). Let’s call them Jay and Nan since I didn’t think to ask if I could use their real names. Anyway, I helped Nan get WiFi working on her laptop (the older generation are seriously wireless-impaired). Nan gave me a shot of “apple pie” (home distilled, and it really does taste just like apple pie–you can even taste the crust!). 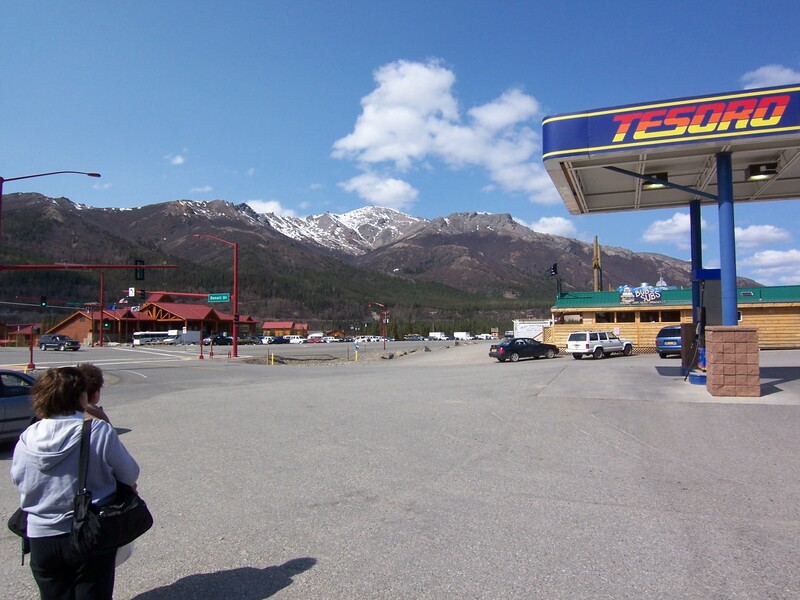 After that, we kept running into each other, and they mentioned that they’re headed to Fairbanks in order to camp-host a nifty place just outside of town. I wasn’t planning on driving that far, but after turning down Santa and the other RV park untouchables, I figured, well, why not? So off we bombed, down 30 miles of rough road, to Rosehip. Just like that, only much faster, and kind of mushed together and overlapping. A couple more steps, and I would have walked straight into it. I look at it, at the yes-indeedy moose. And up, and into those big brown eyes. And it looks back at me, then looks at Mayo. Mayo looks back at it, and then does a strange scuttle-leap about 3 feet further away. Brave doggie, a moocher not a fighter. Thankfully. Oh, wait. I’m getting way ahead of the story. So, while at Beaver Creek the night before (and just short of crossing over the Canada-Alaska border), all the old gassers and gammers were talking about the nasty things that the US Customs people were doing. The most agreed-upon horror was that Customs was searching every vehicle and confiscating all beef, and anything that contained beef. Including dog food. What would all the poor puppies do?!? Especially the ones on special diets? So, we ended up having a beef-o-rama for supper, and an all you can eat cow-buffet for breakfast. Mayo and I dined on beef-n-bean burritos, beef jerky, and swedish meatballs. Then we had Mac and Cheese with shredded steak topping for breakfast. Then we drove through Customs. I dreaded another seach of the Winnii, and entertained dark fantasies of being stuck in Customs Hell between Canada and ersatz home. I noticed that the RV in front of us was one from the Beaver Creek RV Park. They had left at least half an hour before us. And were still at Customs. Definitely not a good sign. We pulled up to the gate. I should note at this point that I added the punctuation for clarity. The above was droned out in one continuous sentence. I should explain at this point that the Customs agent was a rather tall man, and he had to bend down to see under the Winnii’s low-slung cabover. He stood back up after each question, then bent back down again. No, he wasn’t amused by any of this. Yes, I really said this. I was still a little freaked by the whole Canadian SWAT-team approach to border security when we crossed into Manitoba, and was sure that the Americans would one-up the Canucks. My brain finally clicked into gear and told my mouth to shut up. Plus it realized that gassers and gammers spend an awful lot of their time worrying about weird crap. Borrowing trouble, as the saying goes. And I had happily worried and borrowed (and gorged) right along with them. And that was the Great Beef Scare. Anyway, back to the moose. So, those thoughts about what to do when one meets a moose were swirling around and around in my head, and there was this undercurrent of Serious Doubt since most of my moose- (OK, bear-)related information was from old gassers and gammers. While I was thinking all this, over and over, my body took command, turned me around, and walked me away, slowly but with purpose. I still have no idea if that was the right thing to do, or would have signed my death warrant under the wrong circumstances, but it worked this time. And my body marched itself right back to the host camp, Mayo in clingy and evasive tow. Yes. Big. 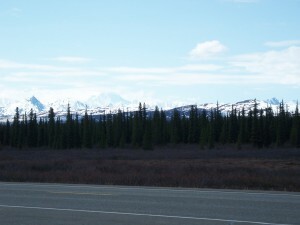 So’s Denali. Saw that too. Cloudy at the top. Makes its own weather. At least that’s what the old gassers and gammers say. Great story! Did you finish off the fifth once you got back safely to your Winnie? this odd size that is sold in soviet canuckistan and is actually bigger than a fifth but smaller than the next size up is referred to by the locals as a “mickey”. the next size up is a “twenty-sixer”. moose are easily subdued by a twenty-sixer, in case you run into another.